This blog is to document my various crafting projects as well as for reviewing and testing any interesting craft ideas I come across on the internet. It is time to use up these craft supplies gathering dust in my home! The finished piece! I used a bit of light blue gilder's paste on the front to give it a bit of color. The design was cleaned up a bit more after this picture was taken, and was given to my mom soon after. I forgot to get a true final picture. I really want to try making one of these again on my own, but I'll definitely need to acquire quite a few tools before that can happen. Ah, well! Oh, and I should mention... I got a great shine on this piece after putting it in a tumbler with stainless steel shot and some dawn soap for a half hour or so. Definitely an important finishing step if you want your piece to really sparkle! This next project took me around 10 Saturdays to complete, so I think it should take at least two posts to properly show it off. So here are the pieces after they had been cut out from the sheet metal. 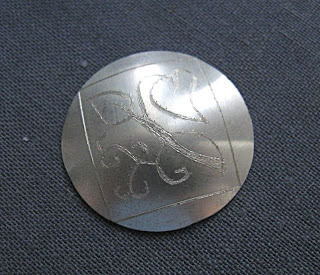 So, the way this worked was I cut two circles from 20 gauge silver sheet metal which would become the outer part of the locket. Then I cut two circles from 26 gauge silver which became the bearing plates for the inside of the locket. 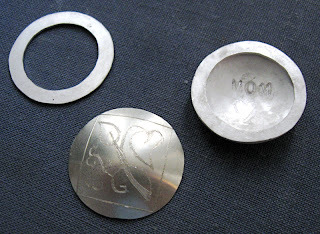 As you can see in the piece to the far right, after doming the large pieces and soldering the cut out circles/bearing plates on, you create a place to insert pictures inside the locket! Here is a close up of the design I chose to put on the front. It is always best to have the design in place before doming or soldering the pieces! 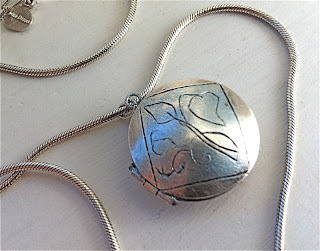 Here is an excellent step by step tutorial for making a locket! Really, I think my instructor must have taught the class from this tutorial! I just also want to say that you definitely need a good amount of soldering experience before attempting a project like this. I still count myself a soldering beginner and this project was a bit... difficult. 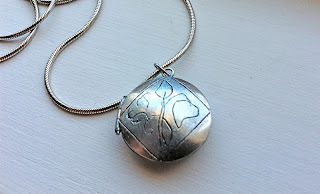 At one point, I actually soldered the entire locket together! It was definitely the hardest part in my opinion! Next time I'll have some pictures of the finished product! I have quite a lot of catching up to do! That is a lovely red orange carnelian in the center! Here is a handy tutorial that is really informative for making bezel settings. It is the first part of a five part series. What I have found to be the hardest part of making the bezel is getting the solder to flow where you want it to go. As a beginner it took me three times to actually get the ring attached to the flat sheet. *whew! * I feel like it does get easier with practice though. Next up, will be my mother's Christmas present. My First Finished Riveted Piece! Here it is! Rivet and all! An exciting first project. I already have a few more planned that I will have to make as soon as I can get my own jeweler's saw and the rest of the equipment. As for my next class, we are going to make a silver ring and I have to start thinking on the design for it. Oh, here is an excellent video tutorial for riveting! Well, we didn't exactly get to the riveting last night. Instead we worked on texture and annealing. For my piece I chose to texture it using a dapping tool. I really like the speckled effect! It kind of reminds me of a starry sky. Additionally, we learned a bit about patinas including using liver of sulfur on both bronze and copper. 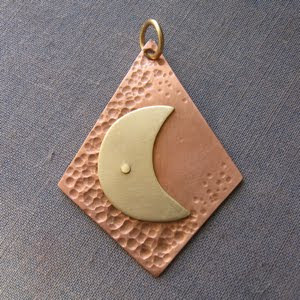 I already posted about my experiences using this substance, so I will just post a quick link back to my previous posts where you can find examples of copper pieces that have been patinated as well as a quick tutorial link. I still have a bit of polishing left to do as well before the two pieces can be joined. Again, next week I should be back with a post on riveting! The next project after this is to make a silver ring and I just cannot wait to come back here with a finished piece! 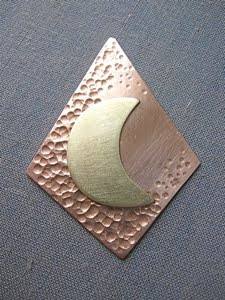 I just had my first metalsmithing class yesterday! I am so excited for this one! For the first class we learned about using the jeweler's saw to cut shapes out of sheet metal. 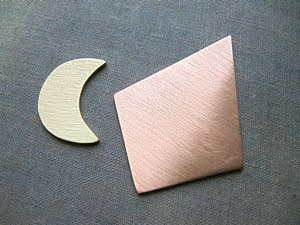 Here are the pictures of my first shapes! Here are some helpful instructional videos for using the jeweler's saw. 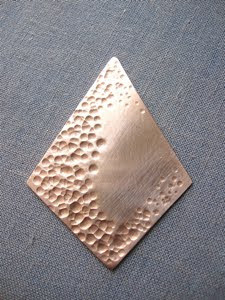 In my class we started with small sheets of copper and brass at 18 gauge and size 1 saw blades from RioGrande. Also, always be sure to use eye protection! Those saw blades do break pretty easily. Additionally, we learned how to file the metal pieces after sawing to get a smooth edge and to get rid of any sharp spots. Here is a good list of tips for filing and smoothing metal bits. Next week we are going to learn about riveting, so I will be back then! Argh! I can't believe I am already behind so early in the game! I am afraid first vacation and then sickness distracted me from posting here. Ah, well. Time to play catch up! Here was my project for Week #3! 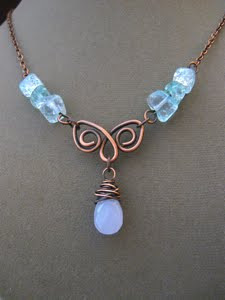 It was actually a belated Christmas present made from crackle glass, copper wire, and a lavender chalcedony drop. This was my project for Week #4. 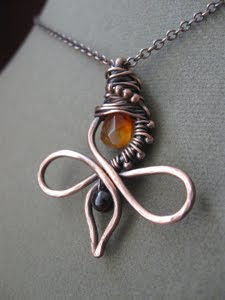 Copper, garnet, and carnelian. 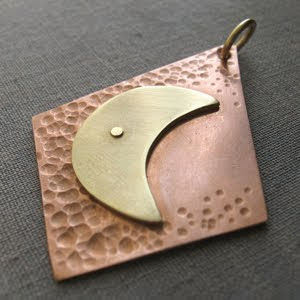 It was actually a practice piece for a sterling silver pendant, but I think I actually like this one better! Aaaaaaand Week #5! 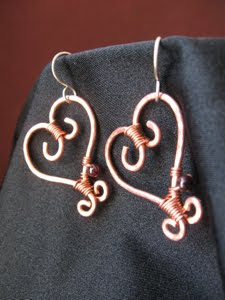 I crafted up a pair of heart earrings! Whooo! Sorry for the project crunch! Still have to post one for this week. I don't have any more updates at the moment. I really need to finish getting together the supplies for my next tutorial project! Here is my 2nd Project for January! 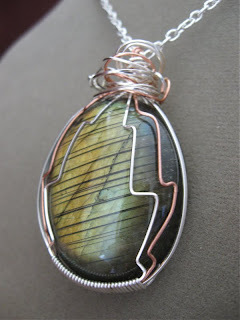 A wire wrapped labradorite pendant! Nothing to report yet on my next tutorial! I am still getting all the supplies together. Hope everyone is having a great 2011 so far! Challenge myself to complete at least one project every week in 2011. 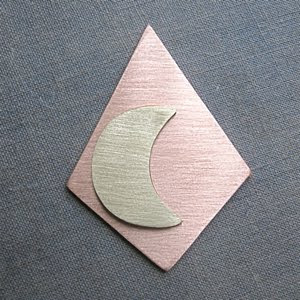 It doesn't sound horribly hard, but at the same time this will also be my first full year crafting for my Etsy shop. There will definitely be more times when I will need a bit of extra motivation! Here it is, my first project of the new year completed! I think for my blackberry mead I am going to use a Champagne yeast from Northern Brewer, an excellent resource for all things brewing! I will be posting the instructions a bit later! So I started that Maple Mead a bit ago and racked it a week ago, but I am not quite sure how it is going to turn out. Sadly it smelled quite acidic, so something might have gone wrong along the way. Definitely going to give it a bit longer before testing again. It should be ready to rack again in a month or so, so we shall see what happens then! If the Maple Mead doesn't work out, I have a recipe (which I will definitely post later) for a Blackberry Mead that I am just dying to try! That is all for the moment! 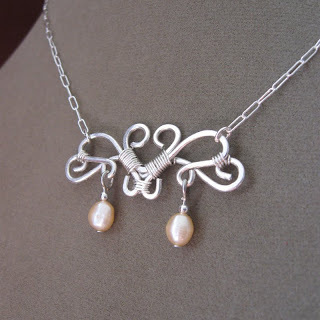 I definitely need to find a new jewelry tutorial to try! Here are my first attempts. I actually really like the way these turned out! The hardest part about making these is finding the right size to clip on to the ear. The first one I made (not pictured) was actually waaaay too small. These turned out just right! I decided to add a garnet bead to the second one I made. Just a bit of extra ornamentation! Definitely going to have to play with these more! Oh, and the picture above? Extremely hard to take when you are wearing the ear piece and trying to take the picture at the same time!! It's time for a new tutorial! 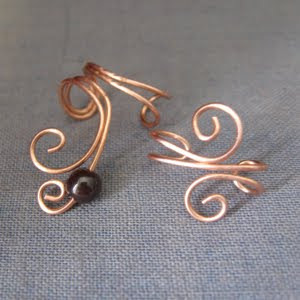 The other day on etsy I ran across pictures of some amazing ear cuffs made by gailavira which made me really want to try and make some wire ear cuffs. 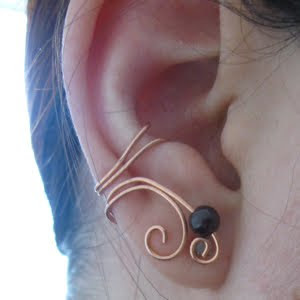 I found this tutorial on CutOutandKeep.net and realized that ear cuffs can be quite simplistic and that maybe a tutorial for them really isn't necessary. I am definitely going to play with this style a bit tomorrow and will post my experiments. I finally started my Maple Mead a few days ago. Yay! Sadly, though, I had a bit of a mishap with the stove/boiling honey. It boiled over quite a bit, so I lost a bit of the water/honey/maple syrup that should be in the jug. Well, it will be ready to be tested in a month when I rack it (move the liquid from one jug to another to filter out the particles), so we shall see if it is the right sweetness/taste then. If not.... then it will be time to add in a bit more honey and maple syrup! So exciting! The one thing I find frustrating with brewing though, is how long it takes to make a mead. Many recipes I have seen call for the drink to sit for a year before it can be consumed! Crazy! In all this mead should take three to four months before it is ready. I can't wait for the taste testing! 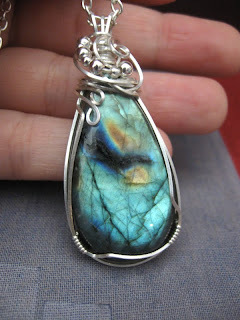 Here is another wire wrapped labradorite pendant! This time I added in a bit of copper and I am really loving the effect! Additionally I have been trying a new type of crafting. Recently my boyfriend has become interested in brewing. It is an interesting process, so I am going to try a bit of brewing myself. 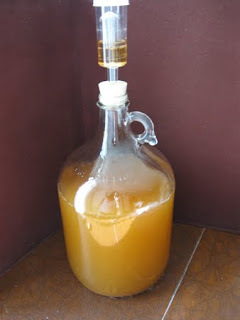 He likes to make beer, but I am interested more in wines and mead, so this weekend I am going to start the process of creating a Maple Mead. I found the recipe here. Should be interesting and I definitely can't wait for the taste testing!